(Nanowerk News) PI (Physik Instrumente) L.P., an industry leader in precision motion components, systems, and solutions, now offers a new line of controllers for ultrasonic direct-drive motors and positioning stages. The new controllers offer greater flexibility and responsiveness to user requirements ranging from precision positioning to handling. Positioning systems based on ultrasonic ceramic direct-drive motors (PIline®) provide very high dynamics and resolution in a compact, low-profile package. PI now offers a new line of motion controllers for these positioning systems to address the requirements for OEMs and research customers. The new C-877.1U11 single axis controller is as small as a deck of cards and priced significantly below the standard single axis controller offered in the past. In addition, a new low-cost 2-axis controller is also available. The digital servo circuit of the new controllers (automatic switchover between static and dynamic PID parameters) takes into account the properties of ultrasonic motors to achieve maximum dynamic performance with settling times as low as a few 10 milliseconds without sacrificing resolution and smooth operation. High resolution inputs for incremental position encoders ensure positioning resolutions in the nanometer range; absolute encoders are supported through the BISS interface. All ultrasonic motors provide fast acceleration and velocities of 100’s of millimeters/second. At the top of the spectrum, the new C-867.262 multi-phase controller allows for extremely smooth motion with velocities as small as 1µm/sec and below, a very critical feature for microscopy and surface nano-metrology. Positioning stages are equipped with an ID chip in the connector and during start-up the ultrasonic drives identify themselves to the controller, loading the matching operating parameters automatically. The controllers are delivered with extensive software packages, including drivers for LabVIEW as well as dynamic libraries for Windows and Linux. In addition, a powerful macro programming language is available, for automation tasks and stand-alone operation. 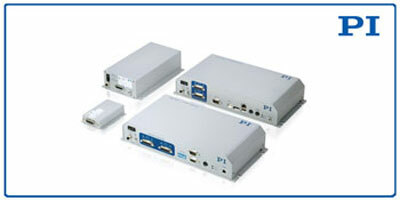 Communication with a host PC is via modern interfaces, such as SPI, USB, Ethernet, RS-232. Applications include precision positioning and automation, semiconductor technology, photonics, bio-nano-technology, metrology, microscopy, micro-manipulation.